Tweet-a-pizza is "the epitome of convenience," according to Domino's CEO. We’ve reached #PeakConvenience, pizzaboyz. 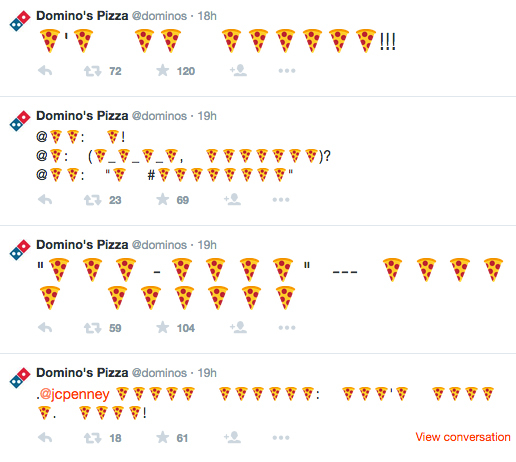 Domino’s announced tweet-based ordering yesterday by sending out a series of cryptic pizza emoji tweets through the company’s Twitter. The pizza chain knows just how to target Twitter-addicted customers who love things that are fast, convenient, and covered with cheese. According to USA Today, the new system includes an option for customers to order by tweeting a pizza emoji @dominos. …the ordering will work by accessing a customer’s profile saved in Domino’s Easy Order system.